Abuja, March 7, 2018: President George Manneh Weah has told Diaspora Liberians that they are part of his administration. 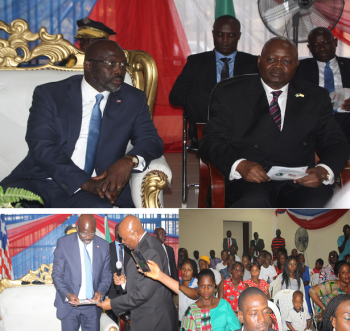 Addressing the Liberian Community in Nigeria as part of his two-days State Visit to Nigeria, President Weah encouraged Liberians in Nigeria and elsewhere to return home and join him to move the country forward. “In my State of the Nation Address [recently], I called on the Diaspora to join us. There is no way we can leave you out of our leadership. You are part of us”, President Weah told scores of Liberians resident in Nigeria. A release from the Liberian Embassy in Abuja says the Liberian leader made the remarks when he met with Liberian Community in Nigeria on Monday evening, March 5, 2018. The well attended program was held at the Liberian Embassy in Abuja. He also encouraged his Diaspora compatriots to return home to contribute to nation-building. According to the release, the Liberian President also re-echoed his position on the need for the country to adopt a dual citizenship law. He added that it is good for Liberia’s growth, going forward. President Weah also tasked Liberians to change their mind and their attitude: “We need to change our mind and attitude, that complacent attitude. We used to say ‘Liberia is a beautiful place. I was born here and I will die here’. The war came and all that changed. So, it tells us we need to change our attitude now and say, ‘I was born here, I can go out and come back to develop here’”. Earlier, the Liberian Ambassador to Nigeria, Professor Al-Hassan Conteh, in brief welcome remarks described the President’s story as “truly inspirational”. “Your story is truly inspirational. It has been heralded in Liberia and around the world as the emergence of a genuine leader from humble beginnings who patiently, patriotically and democratically emerged to the pinnacle of leadership in his nation”, he added. Ambassador Conteh then explained the core business of the Abuja Mission, as driven by Ministry of Foreign Affairs, which centers on representation and reciprocation based on the central tenets of Liberia’s foreign policy. Also speaking earlier, the President of the Organization of Liberia Communities in Nigeria (OLICON), while thanking the President for his decision to meet the Community, presented three points of concern to him for his consideration. Mr. Daoda Kanneh, on behalf of the hundreds of Liberians in Nigeria, said the Community supports the President’s thoughts on dual citizenship. Mr. Kanneh also appealed to President Weah to consider the idea of Diaspora Voting, as well as provide opportunities for Diaspora Postgraduate scholarships. “The Liberian community in Nigeria sees your presidency as a promising moment in our country’s history and a testimony to the confidence which the people of Liberia have placed in you to chart the future course of our nation. We are hopeful that your leadership will inspire hope and persevere in delivering basic opportunities for the people of Liberia”, Mr. Kanneh added. OLICON is the umbrella body of Liberians in living in all 36 states of Nigeria and its Federal Capital Territory, Abuja. The body which serves as a vehicle to mobilize and develop resourceful citizens who will in turn contribute meaningfully towards the progress and development of Liberia. President Weah and delegation, at the end of the evening program, toured the facilities of the Passport Application Center (PAC) which was opened August, 2016, the release concludes.